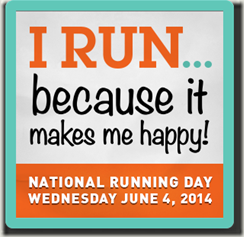 What do you think of the cool badge I made for National Running Day? Get yours here. 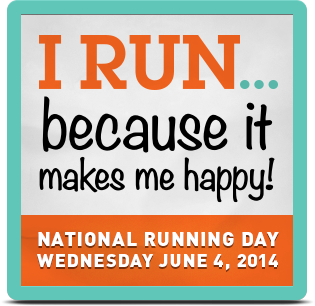 .And after you get creative customizing your badge, check out the other cool ways you can commemorate National Running Day. Tonight is our usual Wednesday Night Workout with our running group. We go to the high school track and pretend we’re fast. Last week I did this cool mile progression workout. It consisted of three sets of 400/300/200 at my goal mile pace with 1 min between reps and 4 min between sets. Not sure what I’ll be doing today, but I’m looking forward to it…because just stepping on the track feels like home.